20 days ago we started incubation on 41 eggs from the ladies, these eggs included parings from all four roosters so this was going to be interesting right from the beginning. The boys, always such a huge help in whatever silliness we have going that week. 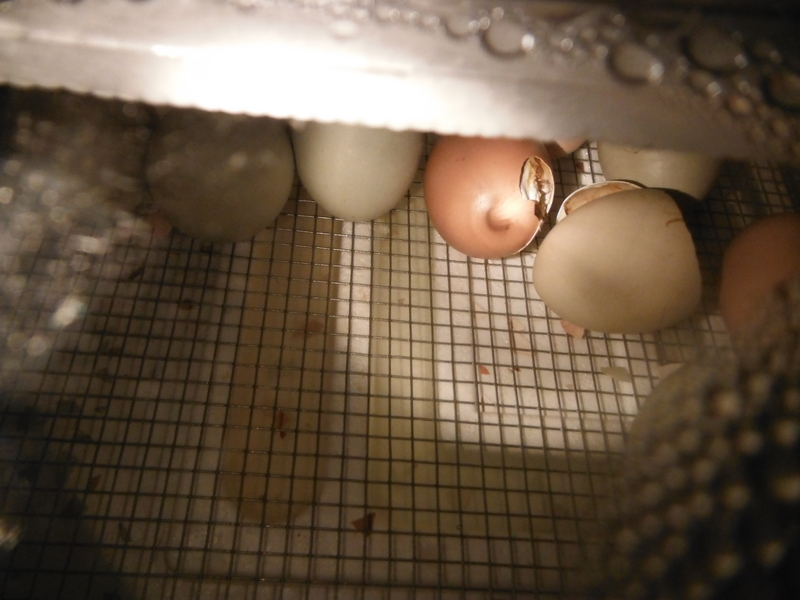 The first bit of excitement comes on day 3 and 6 of incubation. Lets face it- most of the time the eggs just sit there and it is not very entereinaing to watch them. Starring on day 3 you can begin to candle the eggs. There are all sorts of candling kits you can buy but I think if you have a good flashlight and a hand your are all set. Make the ‘ok’ sign with your thumb and pointer finger and lay the egg on it sideways. Apply flashlight the underside and see what you can see. On day 3 there is not much going on, on the thiner lighter eggs you can see a red spider web growing from a central point on the inside. 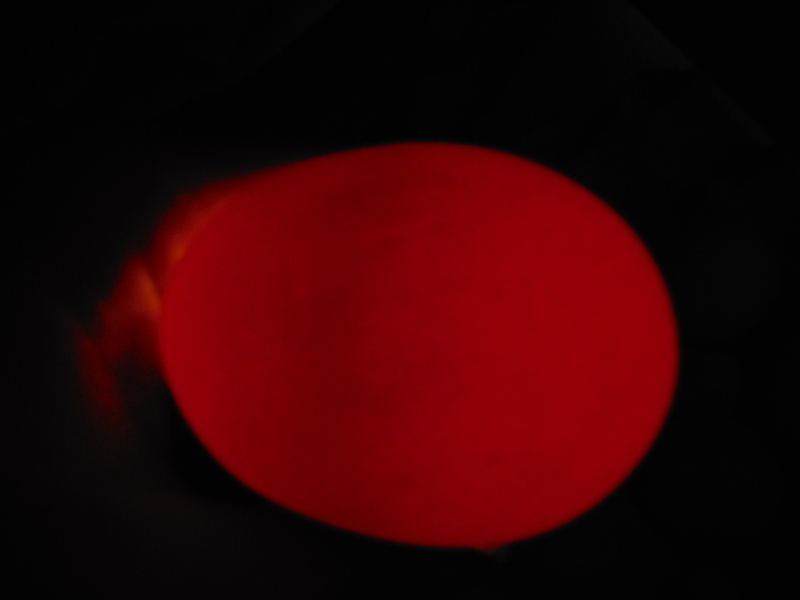 A lot of our eggs are difficult to candle due to the thickness of the shells. Like the amazingly talented person I am- a minute after telling the oldest munchkin to be careful not to drop the eggs, I drop one. I hear you can fix minor cracks with white glue but this was no minor crack and it was only day 3, too early in the cycle to try. You can see the beginnings of the chick and the spider web. It was sad but at least be knew some of them had potential for things other than disappointment. By the seconds and third time you candle (day 6 and 9) the results are much more impressive. By then even on the thick shells you can see a large shadow and an air pocket start to form on one of the ends. 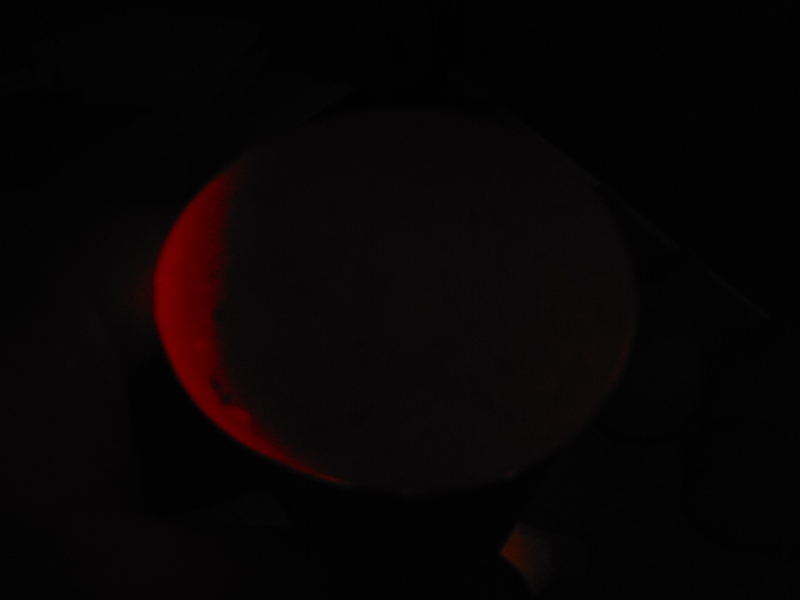 The light part is the air pocket, light does not shine through chicks. If they shine clear at this point they are probably “dead outs” and were either not fertilized in the first pace or have fallen victim to bacteria. Sometime you can see a dark circle where the bacteria gained entrance. You can candle every three days till day 18 but with our shells you could not see much more than that. By day 18 we had under 30 of the original 41 left. I was pretty excited and went running around the house yelling that we were chicken grandparents!!! My husband tried to ignore me but I made it difficult. 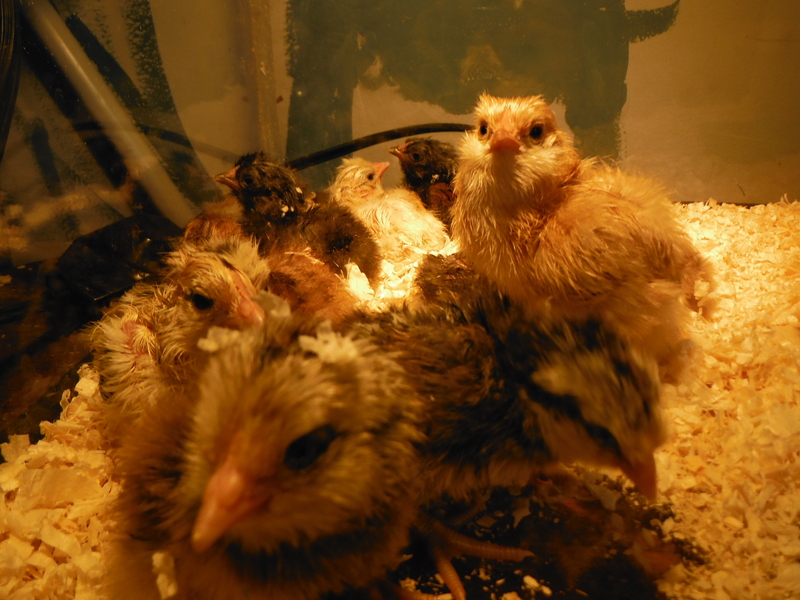 We had six hatch that first day. 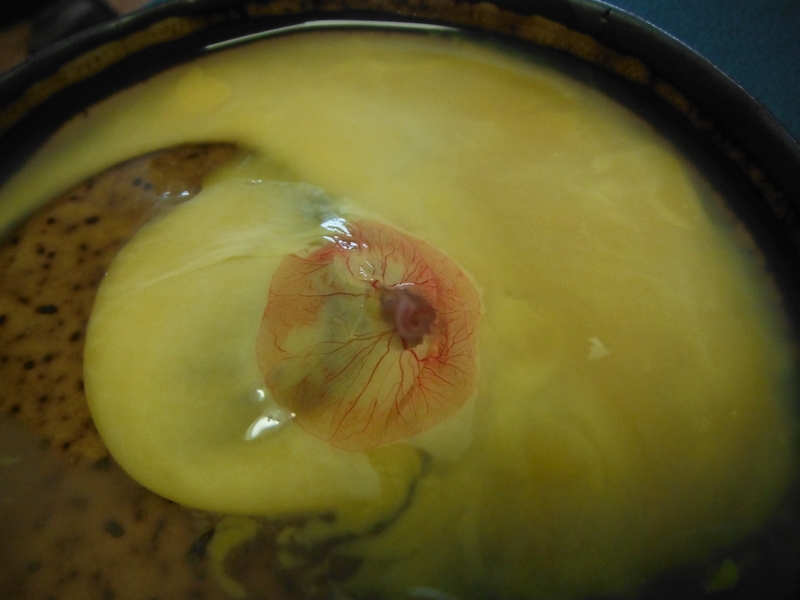 Many people say to leave them in the incubator for up to 2 or 3 days so that you don’t drop the humidity for the other eggs that are starting to hatch. This is supper important as the internal membrane will shrink around the chicks if the humidity drops it will strangle them. It also means leaving then in there with no food or water, they can go without because of the last bit of egg yoke they absorb right before they hatch, some breeders even ship one day old chicks. But the six of them were kicking the other eggs around and yelling to be let out and I could’t help myself. We have a hydrometer on them so it was easy to monitor the humidity. I opened the cover super quick and got all of them out then threw in a wet wad of paper towels and this actually raised the humidity over all. Still a little wet looking they fluff out quickly. We got 6 more the second day and by the third morning we where up to 16 chicks! The 11 eggs that are left in there are way over due at this point. 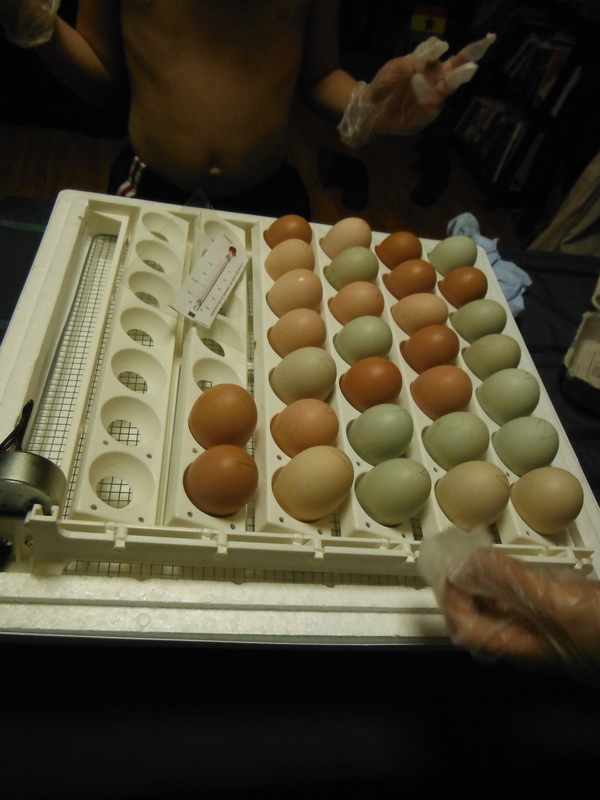 None of them have started hatching and I do not think they are going to but I am practicing patients, well trying to. Most of the eggs left are the really thick shelled green/blue ones that we can’t candle, so they could have been “dead outs” weeks ago and we just can’t tell. For this round I was also only trying to pick Americana hen eggs since we still had all four roosters this way I could be sure of at least one of the parents. The problem is the our Americana ladies are squeamish about mating and run far and fast whenever they can. While the Barred Rocks and Wyandotte are much more willing to get down… so there you have it. 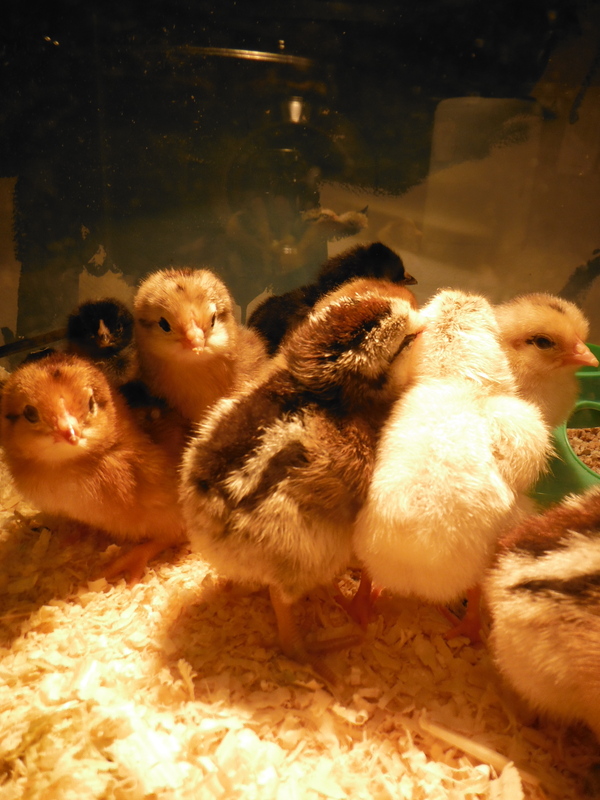 If there is interest I will go over some of our crosses, we did come out with some interesting looking chicks! Please visit our FB page- “Wicked Rural Apothecary-The Facebook page” you will be rewarded with a video detailing the saga of the baby chickens vs the baby crickets. It’s pretty epic. When I first dropped the crickets in there they all ran and huddled. Then one of them (we will call her Killer) killed one in self defense when it advanced on her and realized that crickets are REALLY good. She then embarked on a killing spree and went around eating most of them, while everyone else cowered in the corner. Trust me go check out the video, it’s worth it.